Talent leaves for career growth. Show them the growth you can offer. A data-driven career mobility platform. Paddle HR delivers career recommendations to your employees powered by AI trained on over 370 million people’s careers. Help employees understand all of the various roles available within your company, what skills it takes to get them and when they are available. 42% of departing employees cite the lack of career growth as the reason why they left. Our career mobility platform engages employees, managers and recruiters to get talent moving. Show employees career paths their are best suited for. 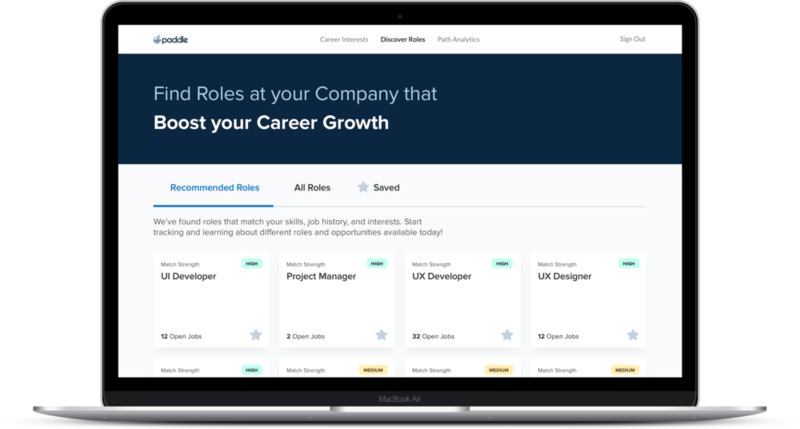 Our AI will automatically recommends roles (open or not) for an employee and allows them to see career growth and skill alignment for each. Give HR recruiters visibility into the most qualified internal talent. Get recommendations based on an open role or search across the whole organization for target skills and experience. Given people managers the tools they need to help their employees grow their careers, as well as source new talent for their team. Managers aren’t always natural career coaches, give them the tools to succeed. Use 370M data points to uncover mobility trends in your organization. Paddle HR’s Career Mobility Report is a great way to get started using data to improve internal mobility. Find out how top roles in your company move, in just 1 week. Join other Fortune 1000 companies that have used Paddle HR to uncover how talent really moves within their organization. Thank you! A member of our team will reach out shortly to schedule some time for us to connect. We would love to show you the first ever career mobility platform, please give us some of your details and a team member will follow-up to schedule some time to connect.